The brand name CAT is more prevalent on a construction site than it might be amongst a range of mobile phones. However, over the last 24 months that same name has begun to increase its visibility in the mobile space. The S40 is does not really offer anything that is particularly groundbreaking and make you want to rush to buy it, but instead it is a refined improvement on what already exists and is a logical consideration if you are in the market for a more rugged phone. If English is not your native language, click the captions button below to view this in your preferred language and for the full written review that accompanies this video click the link in the description. The hardware specifications are shown on screen now. There is no denying that the S40 looks larger and bulkier than many other smartphones but it is not as square or rough around the edges as you would expect. With more rounded edges and generally look and feels more appealing than earlier devices the black rubber that adorns the edges is what assists in resisting drops onto concrete from a height of 1.2 meters. Physical buttons rather than capacitive are a nice touch and mean you can use the phone with gloves on. The main ports remain hidden under covers to assist with the IP rating. Capable of taking 2 nano sized sim cards, these sit in a tray that slides in and out of the device. Due to being recessed into the body it is not easy to remove and you need patience and a delicate touch. Chunky but solid the battery is built into the phone and in total weighs 185g and is 12.5mm thick. The 4.7” display is a good size and allows the overall phone to remain practically sized without being too big or too small. Corning Gorilla Glass 4 makes it tough and resistant to scratches and impacts. The screen has been optimised to deal with wet fingers and those using the phone with gloves on. Many other premium handsets do not allow this. The resolution is a rather low 540 x 960 so no HD resolution movie and media playback going on here. The benefit is improved battery life. If you observe the screen in detail you can tell it is not as crisp and bright as many other phones but it is perfectly usable. When it comes to software Android version 5.1 is installed out of the box, so it is relatively up to date. 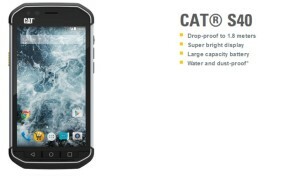 Whilst there are a few additions from CAT they are relatively limited and it means the phone is not bogged down with things you do not need. To get the most from this device you really need a Google account to access many of the Google services but you can easily add your corporate exchange email account and social media logins to this device and be up and running within just a few minutes. Some of the additions you get in the software are shown on screen now. As a Dual SIM smartphone, within the settings you can enable just one or both SIMS, you can choose which is the preferred SIM for what task or have it ask every time You can personalise your homescreens, download apps and make the device work the way that is best for you. Change the font size, the screen brightness, the wallpaper, the lock screen and the device password and more. You can even set different user accounts to limit access and functionality. You might occasionally give the phone to a child to play a game or watch a video, but you do not want them calling your boss or somehow deleting apps, so the guest mode or additional user profiles can come in handy for limiting some functionality. The 1GB of RAM and quad-core processor run fairly smoothly for the most part. Open quite a few apps or ask more demanding tasks of it and it would be a lie if I said it ran perfectly. Containing what you need and want from a smartphone, the S40 has Bluetooth 4.1, WiFi, GPS, 4G connectivity, microSD and NFC all built in. If you are not familiar as a dual SIM enabled phone you can have one or two SIMS in the phone at any one time. Use both a personal and work SIM card in the same phone or maybe a local and international SIM, the choice is yours. If you currently carry 2 phones, reduce this to one with the S40. The solitary speaker on the front is reasonably clear but not as loud as I would have thought or expected. Audible but it could have been better. Ringtones and message alert tones that have more of a ‘shrill’ to them are better in loud environments. A little surprisingly the camera was a lot more feature rich than I expected and even to a bit of a camera buff or those really into taking photos you might be surprised by what is on offer here. The capturing modes are shown on screen now. There are too a series of filers and within the settings you can change the flash mode, storage location, picture size and quality and much more. Switch to video recording and the options are reduced a bit but still a fair number of options. Recording is available at a maximum of 720p HD. There is the option of up to 6x zoom on the camera using a pinch and zoom on screen gesture. And you can use the programmable key to act as a camera shutter button for stills and to commence and end capture. Post image capture the S40 takes a couple of seconds to save the image and be ready to take another image which is a shame. The resulting images are mixed. They are not bad and in natural light ok. However indoors under artificial light the colour balance struggles often being quite yellow and images in general have a bit of a haziness to them and lack the sharpness expected. A 3000mAh battery is packed into this smartphone and there is no denying that this is a decent sized battery. In terms of real world usage, well a lot of this will depend on how active you are when it comes to calls or on using the touchscreen. With a single SIM and average usage we were getting up to 2 days with around 20-30% left at the end of the 2nd day. Still usable but perhaps needing a charge. Insert a second SIM and come late afternoon and evening of the second day and things are a bit weaker and a charge is needed. If you need it there is a battery saver mode too, allowing you to expand the life a bit more if you really need it. To conclude, the S40 is not designed for nor is suitable for everyone. It has been designed to be used by those who need something a little more robust and do not have to have the very fastest processor or hardware specs. 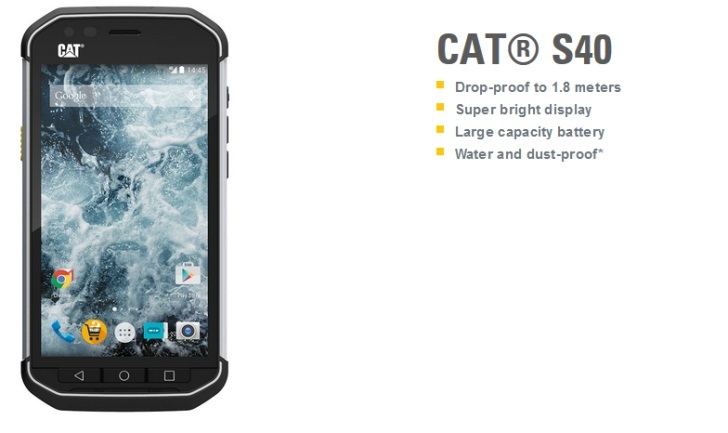 The IP rating means water lovers can be assured that it will sustain exposure to moisture better than most other phones and the Mil Spec 810G rating allows from drops on concrete to take place in confidence that it will continue to function. The refined design, good battery life and physical keys make this a likeable combination for those looking for such a phone and Dual SIM functionality will come as a real bonus for some. You just need to be aware that the speaker and camera are not perfect given the higher price paid for this phone.